Maintain liver health with curcumin. One of the leading causes of death for those 25 to 44 years old is chronic liver disease.1 Patients need to know simple precautions they can take to promote a healthy liver and avoid being a statistic. The liver helps our bodies process what we eat and drink into energy and vital nutrients. It also filters out harmful substances from the blood. 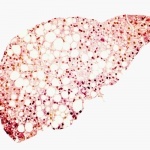 Although the liver will naturally contain some fat, nonalcoholic fatty liver disease (NAFLD) will occur if there is a buildup of fat not due to alcohol abuse. Up to 25 percent of Americans have this disease. The condition can also occur in those with diabetes, so there may also be an emphasis on getting blood sugar under control. No medications exist that are specifically indicated for treating NAFLD.2 However, there is evidence suggesting curcumin is effective in maintaining liver health. As part of your conversation with patients about the many benefits that curcumin offers, encourage them to identify and communicate telling risk factors involving the liver. Show them how they can improve their health by adding this spice to their life. 1 Centers for Disease Control. Deaths: Leading Causes for 2012. National Vital Statistics Reports. 2012:64(10):11. 2 American Liver Foundation. “NAFLD: Non-Alcoholic Fatty Liver Disease.” http://www.liverfoundation.org/abouttheliver/info/nafld/. Published January 2015. Accessed October 2015. 3 National Tropical Botanical Garden. “Curcuma longa.” http://ntbg.org/plants/plant_details.php?plantid=3652. Published February 2001. Accessed October 2015. 4 Wikipedia. “Turmeric.” https://en.wikipedia.org/wiki/Turmeric. Updated October 2015. Accessed October 2015. 5 Vera-Ramirez L, Pérez-Lopez P, Varela-Lopez A, et al. Curcumin and liver disease. Biofactors. 2013;39(1):88-100. 6 Kuo J, Chang H, Tsai T, Lee T. Curcumin ameliorates mitochondrial dysfunction associated with inhibition of gluconeogenesis in free fatty acid-mediated hepatic lipoapoptosis. Int J Mol Med. 2012;30(3):643-649. 7 Tang Y. Curcumin targets multiple pathways to halt hepatic stellate cell activation: updated mechanisms in vitro and in vivo. Dig Dis Sci. 2015;60(6):1554-64. 8 Examine.com. “Curcumin: Scientific review (in-progress).” http://examine.com/supplements/curcumin/. Published January 2012. Accessed October 2015.